garlic recipes | Indian Lehsun recipes. Garlic is a one of the most widely used spice and aromatic in the world. The reason for this is the beautiful flavor it provides to every dish that uses it. One of the oldest known medicinal plants known to man, garlic is used in a variety of cuisines all over the world, predominantly being in Indian, Chinese, Italian and Thai food. Since it is such a versatile ingredient and used in so many forms, it is a great way to incorporate the strong, pungent flavor in your food. Since garlic eaten raw is so pungent, it is ideally cooked first and then eaten. In the culinary world, there are numerous uses and potentials in the way garlic is used. It can be roasted, sautéed, baked, chopped, sliced. While roasting brings out a nice sweet undertone of the garlic, crushed garlic gives a very strong savory taste when used like it does in Ricotta Spinach and Garlic Pizza. Garlic is such an essential element in Indian cooking in all its forms. Almost every Indian household uses garlic paste to make curries and sabzis, to create thick and luscious gravies. Some even make garlic pickles, which are delicious! This ingredient always packs a punch even when cooking humble items like dal, especially Punjabi dals. Asian cuisines like Chinese and Thai make use of garlic in almost all their dishes, a few famous ones of which are Vegetable manchurian, Chilli garlic sauce and Pad thai noodles. Since garlic is so aromatic and beneficial for our health, one should eat it frequently. we can add it to various soups, stir frys and even salads! So try making recipes in which you need garlic in different forms and it will completely lift your food! 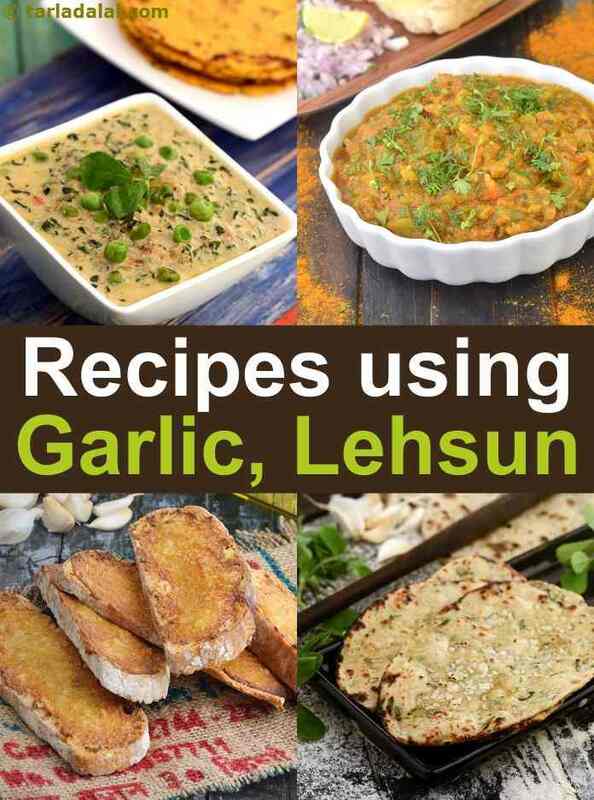 Enjoy our garlic recipes | Indian Lehsun recipes given below. A spiky and pungent chutney, perfect to spread on a roti before rolling it up with interesting fillings. Made with minimal ingredients, the Chilli Garlic Chutney can be prepared within minutes, to be used immediately or stored in the refrigerator for later use.